The RAU and ODH chips have open-drain Power Good outputs. Perhaps these are pulled up to 3.3V at the MCU's input pins? If so, then the MCU would be monitoring the various regulators via their PG outputs, and then possibly generating a single PG output of its own which it then communicates to the Marvell controller. I'm wondering whether two of the enables are buffered by the "CV" chips. If so, then the "A" inputs would come from the MSP430, and the "Y" outputs would go to regulators. Seems unlikely if there's direct connectivity between MSP430 pins and EN pins on the regulators. But I'll check when I'm back home. I'm also working on a deal for a 128GB replacement of the MX100. 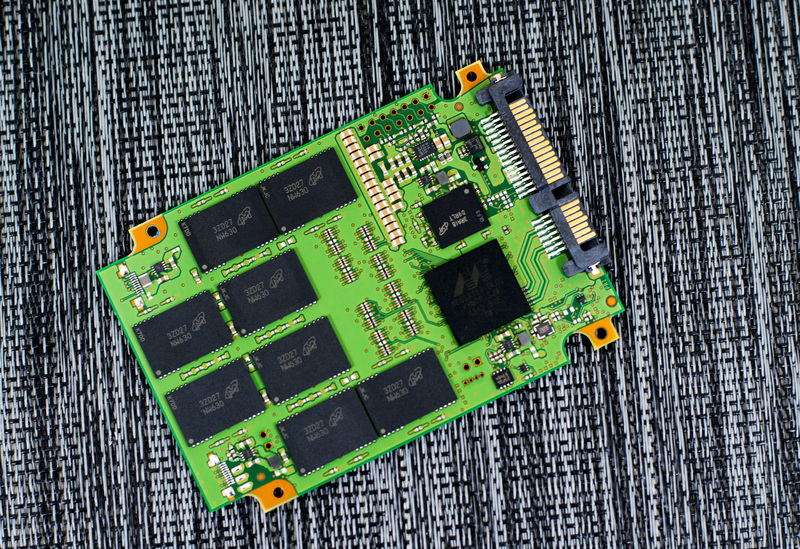 Pictures from many review sites seem to have matching boards for both models (mine is 256GB). I can either get a MX100 in 128GB or a 'micron c400' 256GB at a reasonably affordable price. Supposedly the micron c400 is equal to the crucial M4. Supposedly the micron c400 is equal to the crucial M4. AIUI it's a Micron design. Crucial is an OEM. Do you think it's safe to get a C400 and pull the MSP430 off of that? Isn't the C400 a completely different PCB? MSP430 in the exact same spot. Very similar layout. Worth a shot? Nevermind, that's the M550 and not the M4. I'll stick with a MX100 model. Sourcing a used one is looking harder than I had hoped. The MX200 PCB seems very very similar though, near 1:1 same layout. I'm thinking of getting one of those and move the MSP430 over temporarily. I'm going to need a replacement either way. I would be very cautious and spend some time taking measurements of the working PCB before swapping the chip. The mysterious 43V6ZI chip is a bit of a worry since it is near the power connector. That said, there is a second identical chip at the rear of the PCB. It looks like it might be an LDO regulator (Vin, Vout, Ground, Enable ?). I'm also uncomfortable with +12V being impressed upon the +3.3V SATA input. I wonder where those resistors go, and whether any damage was caused. Hopefully these resistors connect to the MSP430 and not some other chip. BTW, I wish I had your soldering skill. Right, there's that one also. Do you think that's another candidate for transplantation? At any rate, I don't think the transplant is very risky. After removing the MSP430 I can see that there's no heat generation on the PCB at all. The entire disk draws less than 100mA from my bench PSU. I would measure all the voltages on the working board, including those at the 43V6ZI chips. If we knew what this chip does, and where it gets its Vin, then maybe we won't need to touch it. I would also measure the gate voltage at the MOSFET, and its D-S resistance. I'd confirm that the V1 load resistance is also 50 ohms on the donor. Perhaps if you were to compare all the load resistances, then this would give us some confidence that the NANDs and flash controller were OK.
+1.7 v, +1.2 v, and +1.0 v on the inductors near RAU. The MSP430 is marked "V402". I guess that means it has a different firmware version. I wouldn't trust it. Well, enable pins seemed to match so I performed the transplant. Was pretty confident in the soldering but it didn't work so I opted out of further risking the new 250GB disk. Removed the MSP430 from the dead SSD and placed it back on the new MX200. First try wasn't very good, probably because I didn't perfectly level the pads before soldering and it ended up not being perfectly aligned. I took it off, cleaned the pads, used leaded solder instead and although the result was imho still pretty bad, it didn't look misaligned. Pic attached. Plugged in the disk and it got recognized, hdtune says all blocks are still fine. So no material gain or loss either for today but at least I've got confidence a replacement isn't too difficult. The search for a proper donor continues..
FWIW, I had a look at some of TI's power chips. For example, the TPS65910 is a Power Management Unit (PMU) that integrates several switchmode converters, linear LDO regulators, an Embedded Power Controller (EPC), and an I2C interface for communicating with other MCUs. It would be like integrating the MSP430 (an EPC) and all the regulators into a single chip. The TPS65910 incorporates several power sequences for different processors, and these are selected via two pins, BOOT0 and BOOT1. The first supply to come up is Vio. After all the supplies are up and running, the chip releases the NRESPWRON signal (active low power-on reset). Of course this chip is of no use to you in your application, but I thought its datasheet might help to understand how your board works. Thanks so much for your help troubleshooting fzabkar! 000059D0 69 70 20 72 65 76 69 73 69 6F 6E 3A 20 25 53 0A ip revision: %S. AISI, this would suggest that the MSP430 communicates with the flash controller. The signature is "M430" which would suggest that it represents the firmware for the MSP430. The MCU is referred to as an ASIC. Perhaps an alternative solution would have been to purchase a blank MSP430 and program it with the image from a suitable MX100 firmware update.